A series of airstrikes also targeted fighter jets, air defense systems and SCUD missile launch pads in Sanaa. 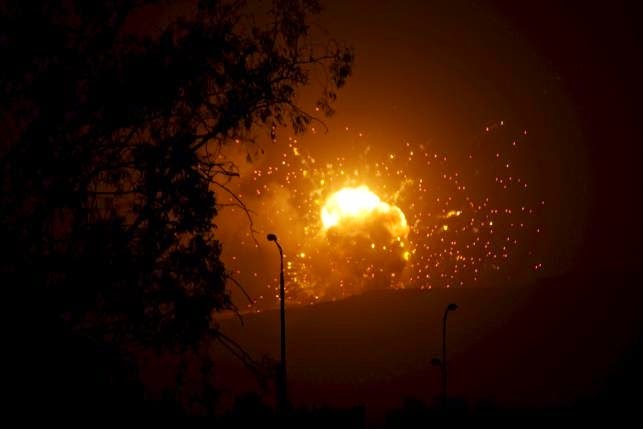 Later the strikes hit weapons depot on the Faj Attan mountain overlooking Sanaa, causing the explosions of SCUD missiles and sending balls of fire into the sky. The Houthi-run TV network said the coalition bombed a displaced persons camp in the northern rebel stronghold of Saada, killing 40 people, including women and children. The Associated Press quoted witnesses, however, who said the camp was from an earlier conflict in the country that ended five years ago and was now being occupied by Houthi forces. It was not yet possible to resolve the conflicting account. So will the Huthi/Salehists forces be able to receive supplies via Oman? What is Oman's position here? Stressful I'd imagine! Have gcc naval assets been seen in the gulf of Oman yet? If so, what is the potential of them intercepting shipping between Iran and Oman? Any demographic maps about anyone?